If you’re in the market for natural and organic skincare products, you may know of a brand called Ava Anderson Non Toxic [AANT]. Some of its personal and skincare products include a moisturizing mask, exfoliator, sugar lip scrub, eye cream, makeup remover, and more. In addition to its popular skincare line, this company offers an array of other products, including cosmetics, hair care, body care, baby care, sun care, pet care, scents, bug spray and home cleaning products. My friend, Courtney Zahm, an AANT direct sales representative, introduced me to the company and recommended three facial products for me: hyaluronic acid, spray toner, and night serum. I tried these items in combination over a one-month period (until I ran out of product). Prior to receiving this HA serum, I had been using the popular Neutrogena Hydro Boost gel-cream (main ingredient is HA) that comes in a twist-off jar. Right off the bat, I liked that this HA is dispensed from a pump bottle, which prevents oxygen from potentially interfering with the efficacy of its ingredients. I also liked the fact that it lacked any controversial chemical ingredients, such as parabens. Fragrance-free and elegantly textured, this twice-daily HA serum made my face feel sufficiently moisturized, without feeling greasy or oily. While HA, its main active ingredient, is most responsible for moisturizing, it also contain allantoin and calendula extract to boost hydration. I was able to use the HA minutes before my daily tinted moisturizer with SPF (not an Ava Anderson product), without feeling over-moisturized. In addition, the HA immediately appeared to brighten my complexion (I believe this is attributed, in part, to the radish extract), and the subtle glow lasted for hours. 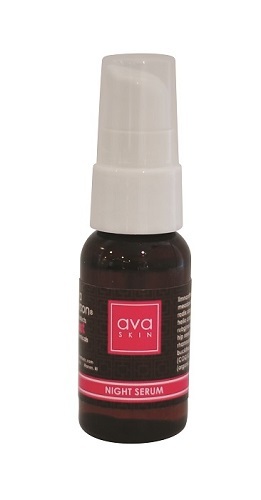 Since the HA is a serum, it spreads easily, and a small amount goes a long way. Since it lacks viscosity, it can easily run off the palm or in between fingers and thus be wasted. In an effort to conserve and adequately apply it, I found it most helpful to pump once directly onto my pointer finger pad and immediately dab it on my face and then rub it in. Two pumps – one per side with allowance for some on my decolletage – did the trick for sufficient coverage. I actually looked forward to applying it both day and night. Alcohol-based toners can be drying and irritating. A popular, natural alternative is witch hazel, which is the main active ingredient in the this toner. Yucca glauca extract is also in this toner. The extract is a lesser known and used substance with reported anti-irritant properties that encourage cell turnover. I believe in the role of toner in one’s skin care regimen. I think of toner as a primer before the other steps in my daytime and nighttime routine, such as applying a moisturizer. This toner is the first spray toner that I have tried. While it’s fun to pump three to four spritzes directly onto my face, with eyes and lips squeezed shut, I prefer to apply toner in the traditional way, by rubbing it on. This is just a personal preference. I do recognize that some product is lost when applied to a facial cotton ball or gauze, which argues for a spray toner. But the gauze lifts any excess grime from my face after washing. I sprayed this toner onto a cotton round and found that it required twice as many pumps (six to eight) to saturate the pad sufficiently, which means if done daily or, better yet, twice daily, the toner would run out well before four weeks. This nighttime serum is thinner/more runny than the HA serum. I definitely recommend applying it in the same fashion as the HA serum. One pump covered my entire face, and two pumps cover my face and decolletage. Most nights, I used two pumps because my decolletage could use some tightening, too! As a result, I ran out of all three of the products around the same time. Like the HA, this fragrance-free serum is lightweight and elegant. I used this product alone at night, after applying the toner, and it consistently left my skin feeling very soft, an effect that I still noticed when I woke up the next morning. Like the HA serum, it is a product that I looked forward to applying and have missed since running out. COQ10, an ingredient that purportedly repairs and resurfaces the skin on a cellular level, seems to contribute to its softening effect. Over time, COQ10 is also supposed to cause tightening and brightening of the skin. Although my exposure to the night serum was brief, I felt that my face was headed in that direction – the texture already appeared to look healthier, brighter, and, younger. While using all three products in combination, I do not recall having any acne blemishes. Since running out, I have been battling a few scattered small pimples every other week or so. My complexion has also looked more dull and “tired.” I think these changes are very telling, and I attribute an improved complexion to the concurrent use of the products. The pricing on all three products is competitive with comparable over-the-counter products. But some may find the company’s proclaimed and promised mission to use only all-natural and organic ingredients to be an added benefit.